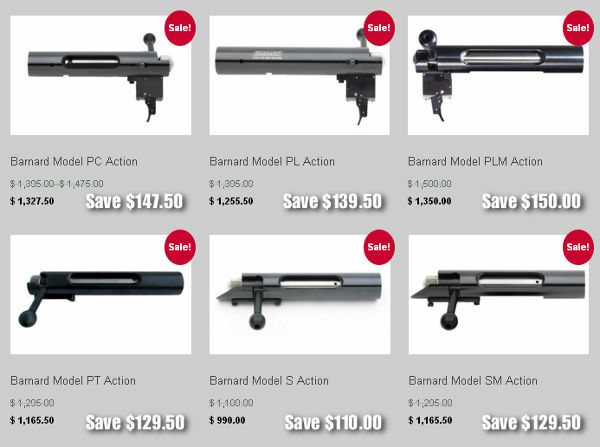 Barnard makes great actions, many of which come complete with superb two-stage triggers. 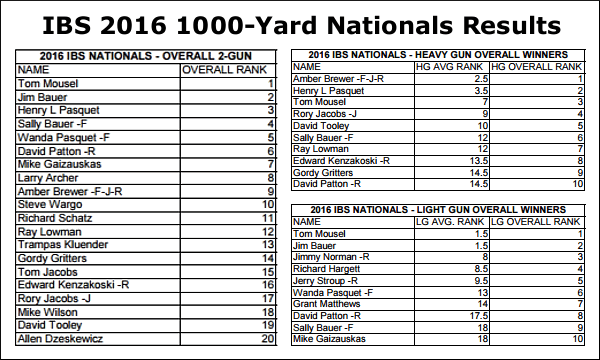 For a long-range competition rifle, a Barnard action is a very good choice. 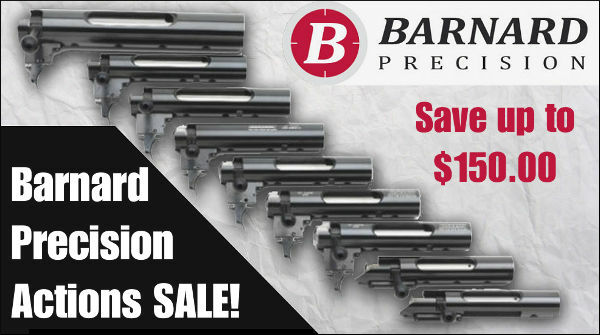 And now you can save up to $150.00 on Barnard Precision actions, complete with trigger. 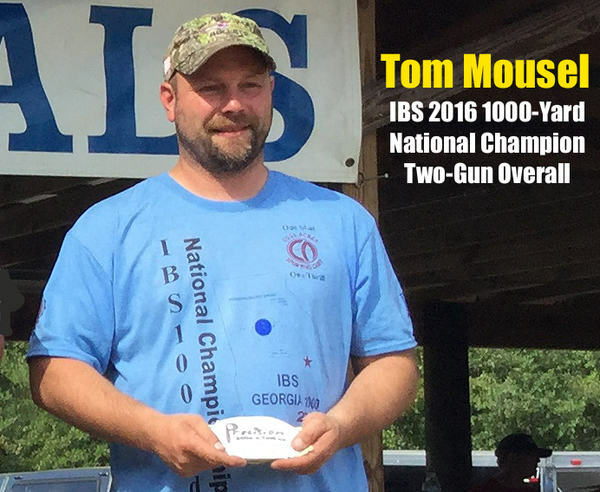 Our friend, 4-Time National Long-Range Champion John Whidden, decided to offer a special Holiday Promotion for shooters. A wide selection of Barnard actions have been discounted 10% (ten percent). This is a great opportunity to save money. Q: In addition to the Model P, What Other Actions Does Barnard Produce? Whidden: Many shooters familiar with the Barnard Model P, but we now carry six (6) other Barnard actions. 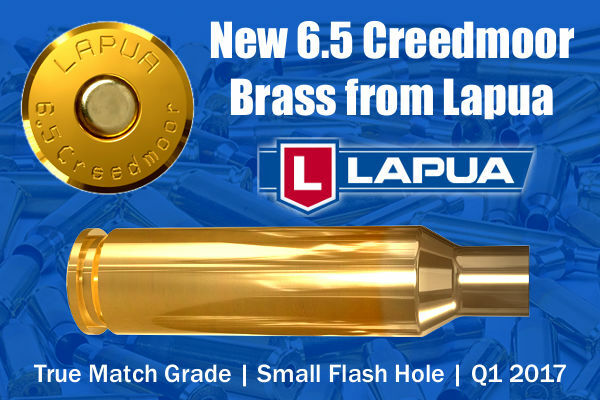 These include the PC action with multiple bolt/port options, the Model SM repeater (with Rem 700 footprint), and the PLM which is a perfect fit for the big .338 Lapua Magnum cartridge. Q: What Are the Key Features of Barnard Actions? 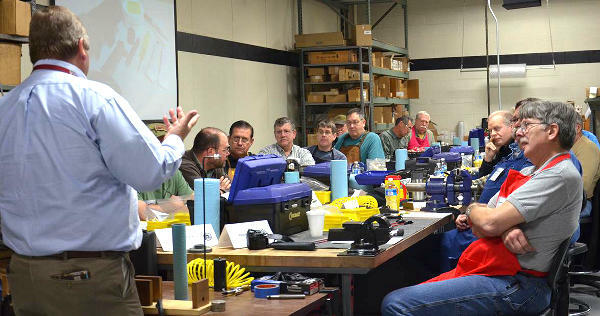 Whidden: Barnard actions have won a reputation for accuracy, robustness, and exceptional straightness and quality in manufacture. Their design is very rigid and stiff. 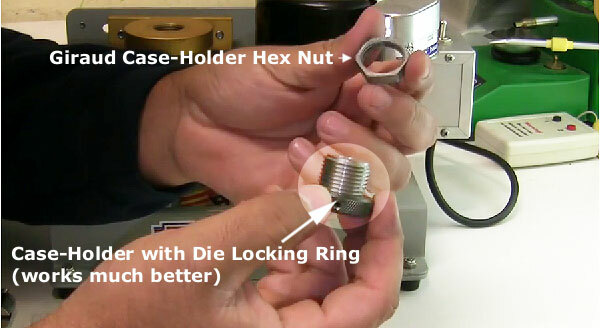 The three-lug bolt gives a short bolt-lift. These qualities are available in the full line of of Barnard actions. 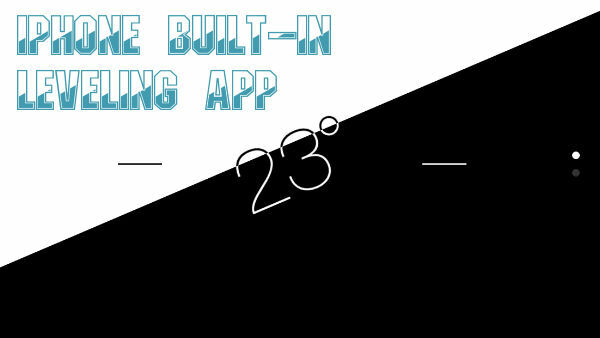 The fact that many models include the excellent Barnard trigger make them a good value among custom actions. Q: What Barnard Actions Do You Recommend for Particular Disciplines? 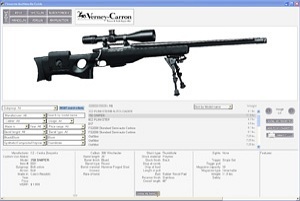 Whidden: For those interested in F-Class and Long Range Benchrest shooting styles the Model PC is very attractive. The PC is the same size and footprint as the familiar Model P except that the PC offers different bolt/port configurations. Available in the PC are right bolt/left port, left bolt/right port, and dual ports. 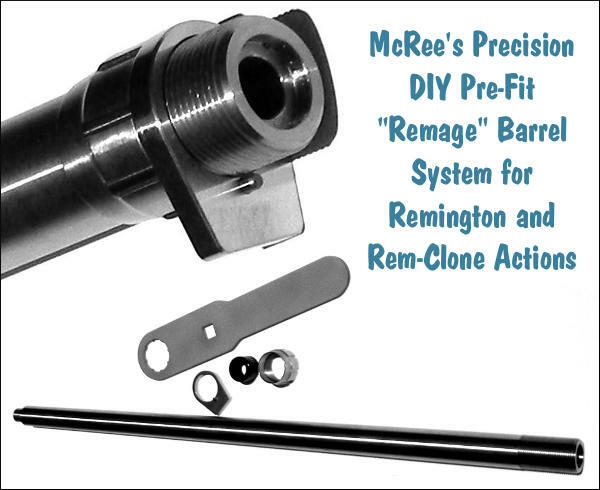 The Model S and SM actions will accept Remington pattern triggers and fit into stocks inletted for the Rem 700. 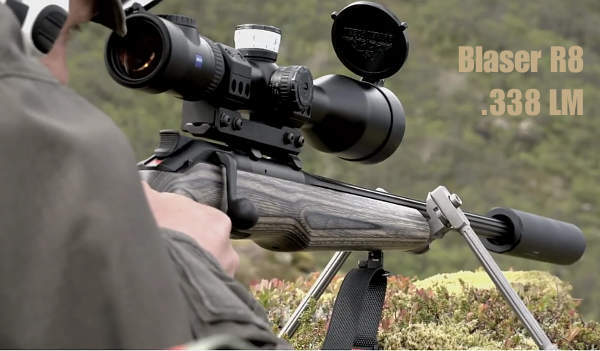 This gives PRS shooters the chance to have a superb action with a three-lug configuration for their use. 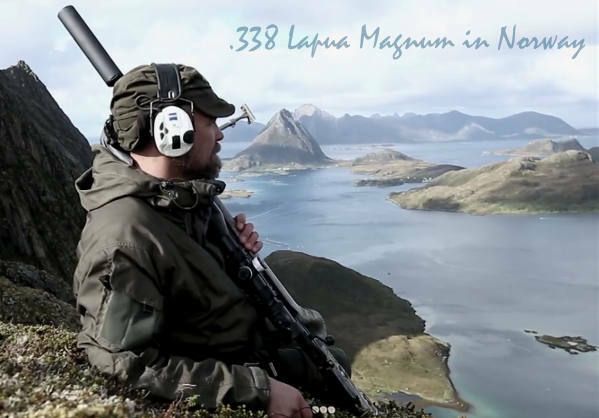 The PL and PLM are sized for the .338 Lapua Magnum cartridge and wildcats based on that case-head size. 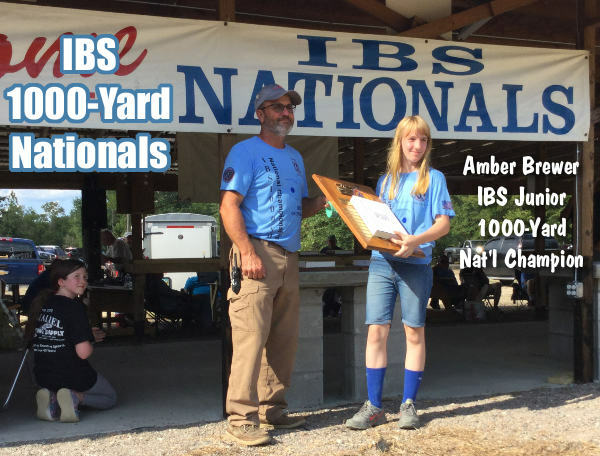 Share the post "Barnard Actions on Sale at Whidden Gunworks"
Share the post "2016 IBS 1000-Yard Nationals at Georgia’s Cool Acres Range"
A fire in the home is always to be feared. And a fire in your reloading room can be disastrous. Near your reloading bench you probably have flammable solvents, and maybe gunpowder. What would happen if an electrical fire started in your reloading room? Would you be alerted? Do you have a proper fire extinguisher at hand? Here’s a true story from Forum Member Joe O. (aka “Joecob”) that provides a valuable safety lesson. After Joe started up his old tumbler, an internal connector worked loose, causing an arc which started a fire in his basement reloading area. Luckily Joe had a functioning smoke detector, and a fire extinguisher. 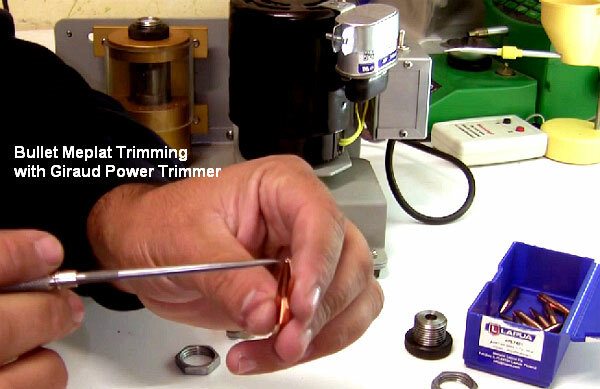 Very few of us would worry about fire when we plug in a tumbler or other AC-powered reloading tool. But there is always the possibility of a malfunction and a fire. Quick thinking (and a handy extinguisher) prevented serious damage to Joe’s reloading room and house — but things could have been worse (much worse), had Joe not responded quickly. The day before ‘Sandy’ hit I was cleaning brass the way I always have. 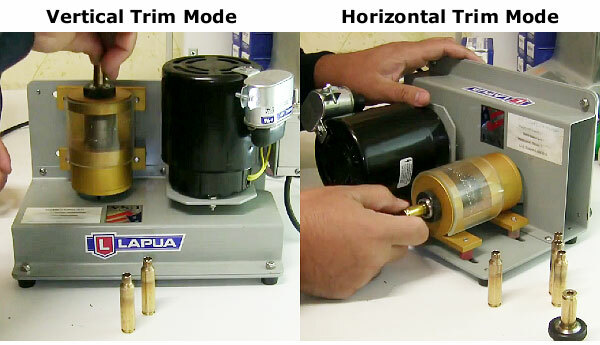 I set the vibratory tumbler on the back of my reloading bench in the basement. 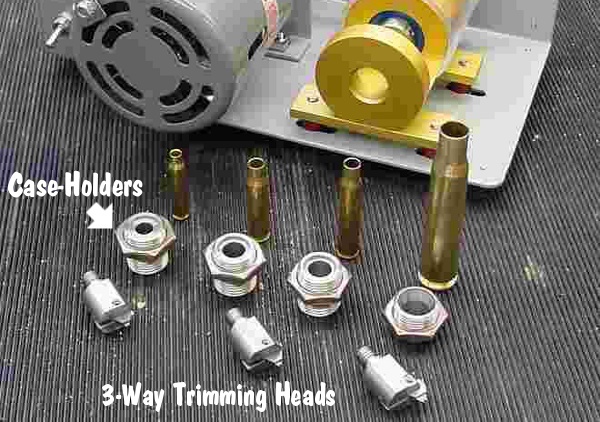 I loaded the media hopper with 40 fired empty brass cases (and walnut media), plugged the cord in, turned the tumbler on and went back upstairs to watch TV. I could hear the tumbler running in the background. About half an hour later I heard the basement smoke alarm go off. I ran downstairs. Flames were licking from the melting plastic of the tumbler. I grabbed the nearby ABC cannister extinguisher and squirted out the fire and soaked the charred bench areas with water. Good thing I had the extinguisher! And I was glad I religiously store powder and primers properly — away from the bench (and everything else). What caused the fire? It looks like an internal AC connector finally vibrated loose enough to arc and ignite the plastic. WHEH! I had been using that thing for 25 years the same way without mishap. Guess I should have known to periodically check the guts of a thing that plugs in and vibrates for a living? Today I went out and bought a new even bigger ‘Pro’ ABC extinguisher, plus a dual-detector smoke alarm, and an ultrasonic cleaner. That experience was scarier than the storm. I hope this true account might help someone else to avoid a bad experience. In his account, Joe refers to an “ABC” cannister fire extinguisher. The “ABC” refers to the fire classification rating: Class A (trash, wood, and paper), Class B (liquids and gases), and Class C (energized electrical equipment) fires. There are many brands of ABC-rated extinguishers. The rechargeable Kidde 210 unit contains four pounds of a multipurpose monoammonium phosphate dry chemical extinguishing agent. 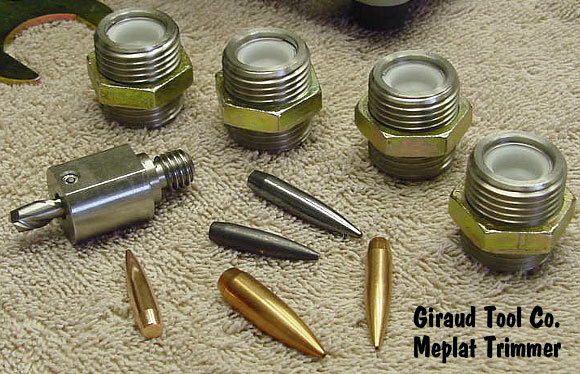 It has a discharge time of 13 to 15 seconds, a discharge range of 10 to 15 feet, and an operating pressure of 100 PSI. 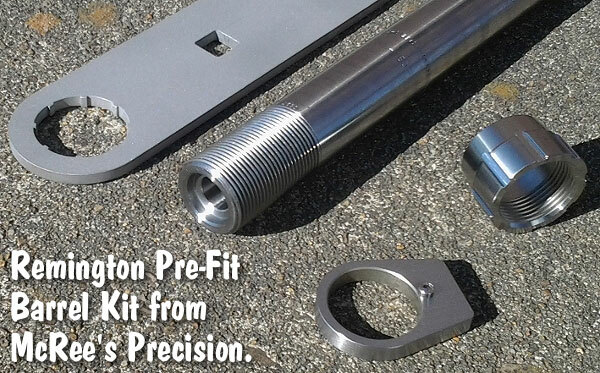 The seamless aluminum cylinder measures 4.5 inches in diameter and 15.7 inches tall. The Kidde 210 has a six-year limited warranty. Forum member Steve Urban says: Make sure to inspect your extinguisher every year. Turn it upside down and then right-side up. You should be able to feel the powder move freely in the extinguisher. If not, it is time to get a new one. 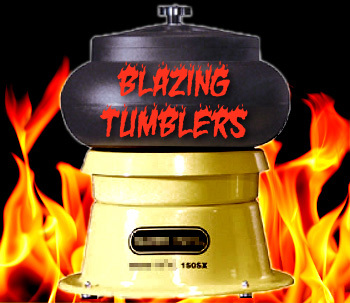 Share the post "Close Call: Tumbler Catches on Fire in Reloading Room"
Three leading steel target manufacturers are running some very exciting sales promotions this weekend. 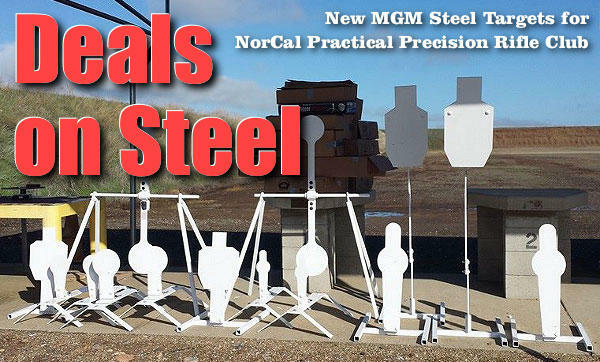 Customers can save 25% to 35% on quality steel targets from MGM Targets, ShootSteel.com, and X-SteelTargets.com. With a big order, you can also get FREE shipping from each of these target markers. 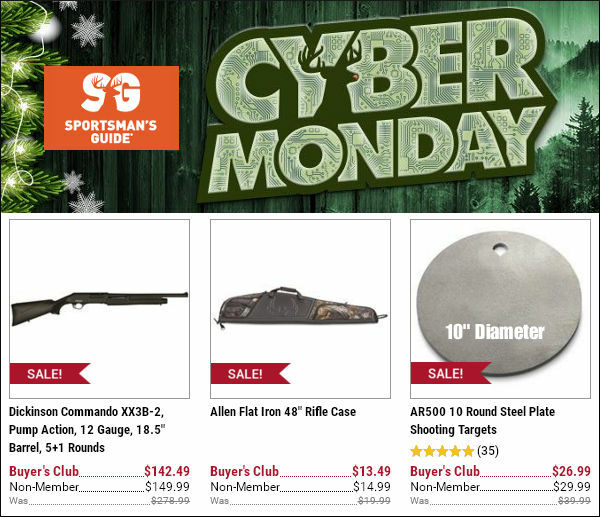 If you want to get steel targets at bargain prices, don’t delay — these promotions expire soon. 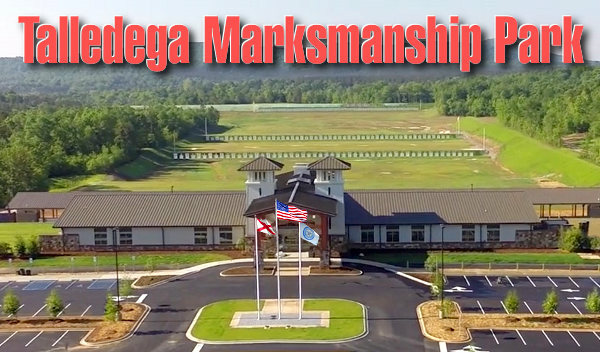 MGM Targets is one of the leading steel target producers on the planet. 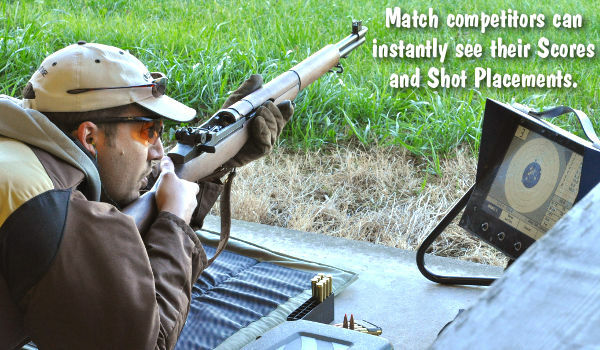 MGM offers a huge variety of targets, from simple steel gongs to elaborate shooting arrays and spinning targets. Now through Tuesday, November 29th, MGM targets is offering 25% Off its in-stock target inventory (except for cardboard and Sportsman Series targets). 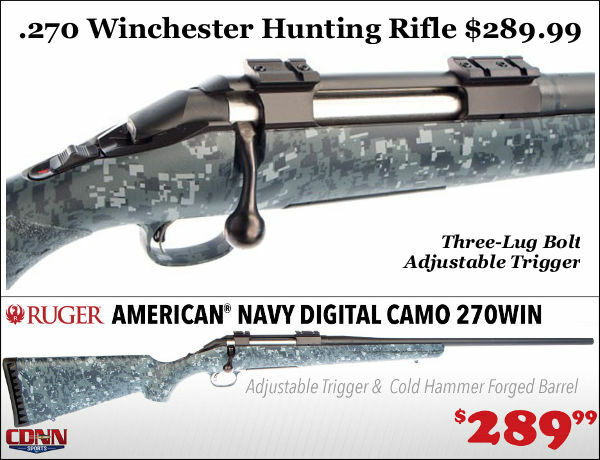 In addition, you can get FREE Shipping on orders of $250.00 or more. For orders placed before Midnight on 11/29/2016, MGM guarantees delivery by Christmas. 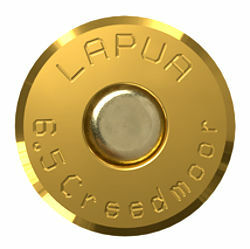 A reactive MGM target could be a great Xmas gift item for a shooter in the family. 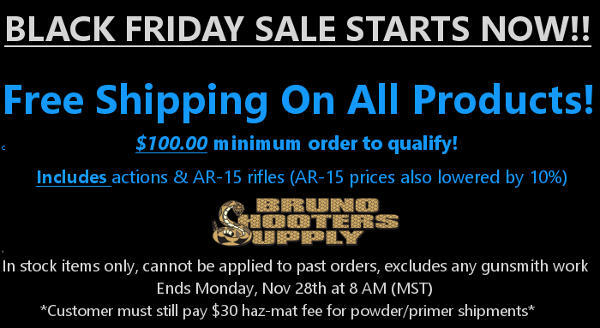 Promo pricing is good through end of day, November 29, 2016. We love steel targets for a variety of applications. 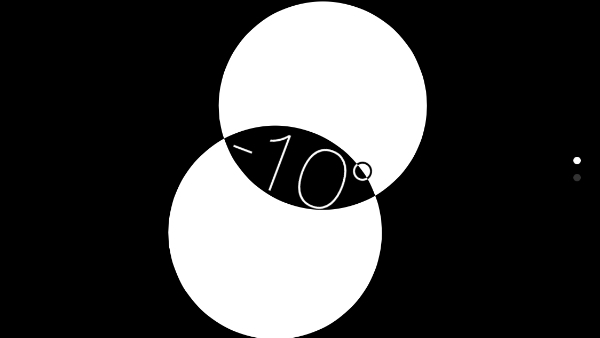 Even if you prefer shooting paper at long range, setting up a gong at your target distance lets you quickly confirm your zero. Hearing the reassuring “clang” as you hit the steel confirms that you’ll be on paper. If you are a tactical or PRS shooter, you’ll be shooting steel at your matches, so it makes perfect sense to have steel practice targets. Last but not least, reactive steel targets are great for novice shooters as they provide “instant gratification” when one scores a hit. 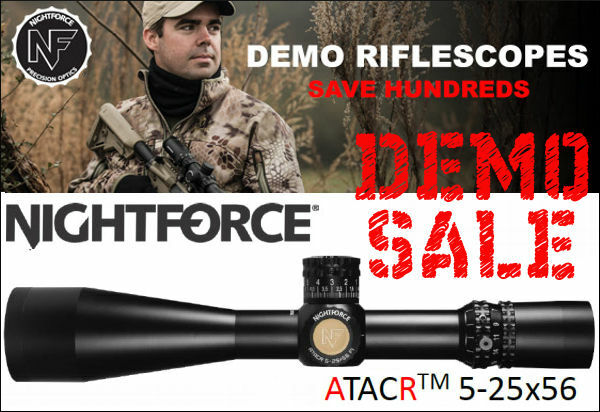 ShootSteel.com has put almost all its entire steel target inventory on sale at 28% Off. Use Code “28OFF” for that deal. 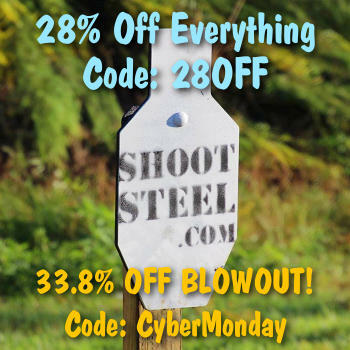 In addition, a variety of Blowout Steel Targets will be offered at huge savings — 33.8% Off. 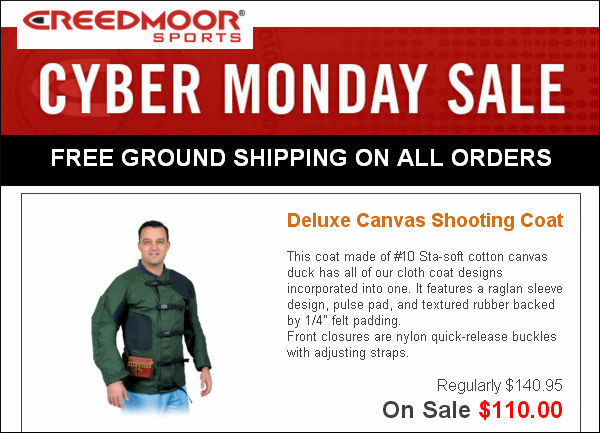 Use Code “CyberMonday” for these exceptionally-priced Blowout items. ShootSteel.com also offers FREE Shipping on orders over $199.00. Offers can’t be combined, orders will not be combined. 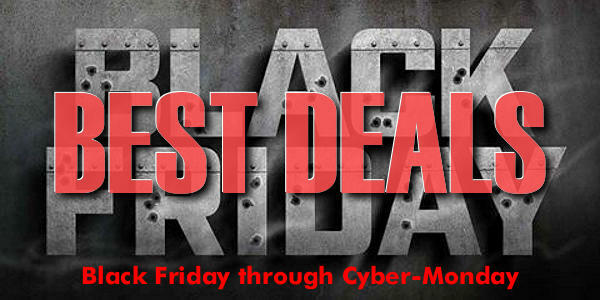 Don’t delay — the sale runs through the end of day Monday, November 28th (CyberMonday). 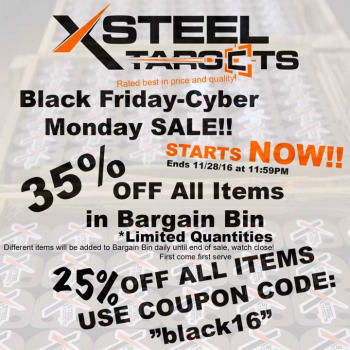 X-Steel Targets is running a great sale this weekend, with nearly its whole line of Steel targets priced at 25% Off. Use Code “Black16″ during checkout to get the 25% Off pricing. 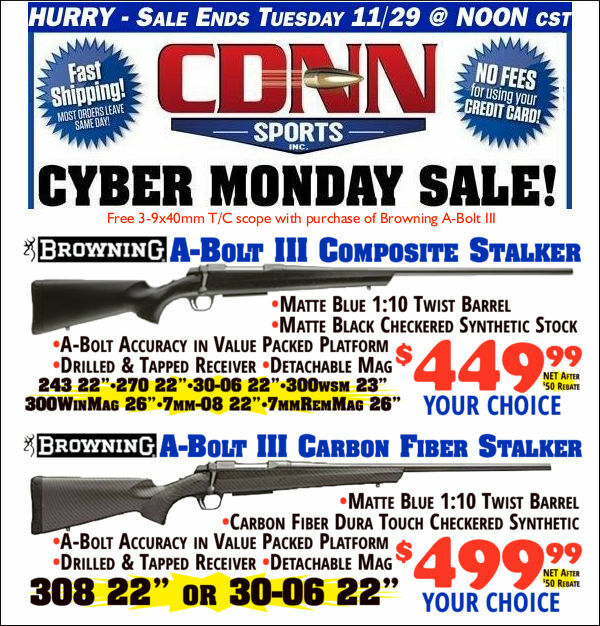 In addition, X-Steel Targets has a host of Bargain Bin items at up to 35% Off regular price. Different items will be added to the Bargain Bin each day. NOTE: The Bargain Bin items are in limited supply. Once they are gone, they are gone. 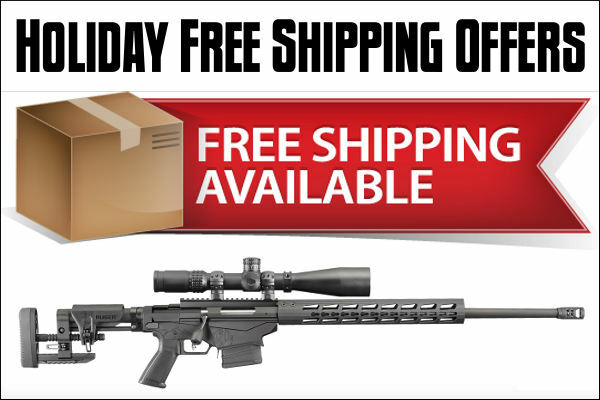 X-Steel Targets also offers FREE Shipping on orders over $250.00. 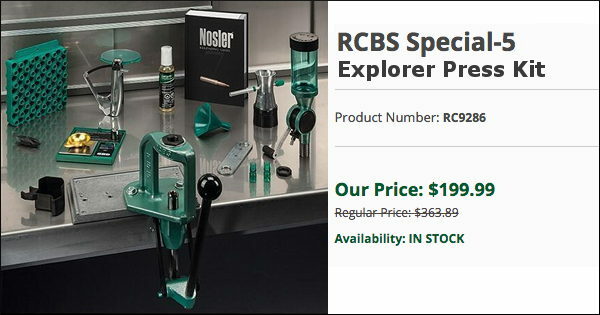 This offer expires on 11/28/2016 at 11:59 pm. 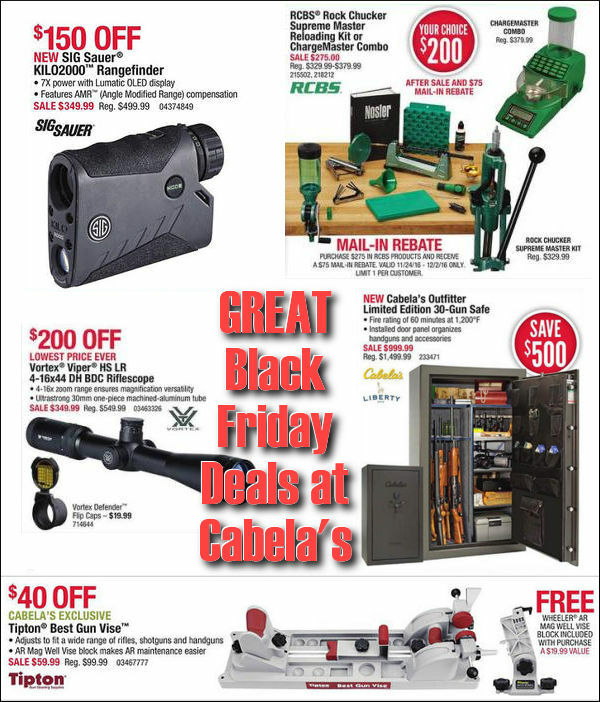 Share the post "Steel STEAL– Bargains on Steel Targets from Three Suppliers"
Share the post "On the Level — Use Your iPhone’s Leveling App at the Range"
Black Friday starts today — at least at MidwayUSA. 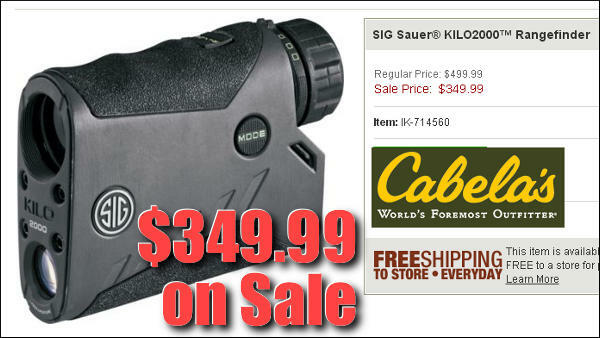 Starting Monday, November 21st, you’ll find super bargains at MidwayUSA all week. 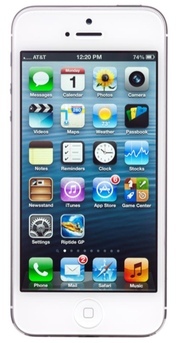 Prices have been slashed on dozens of popular products. 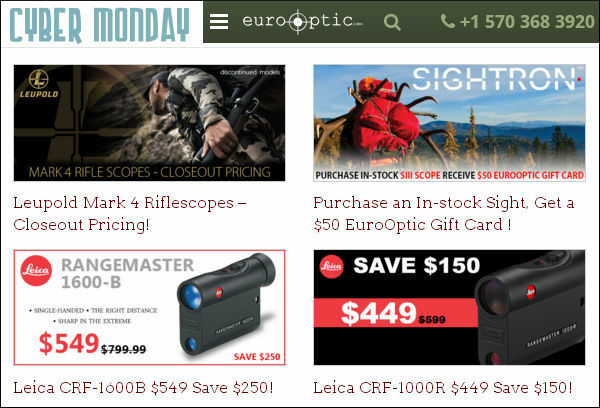 Above are six Black Friday bargains that caught our eye — check out the major price cuts on Leupold VX-6 scopes, and save 15% on Sierra bullets. This is just the tip of the iceberg — dozens of other products are on sale. 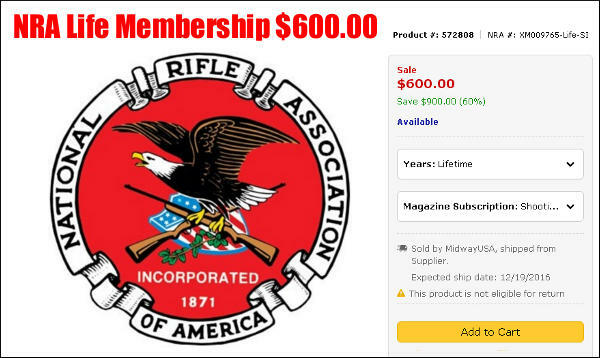 Loaded ammo is deeply discounted and you can even get an NRA Life Membership for just $600.00. 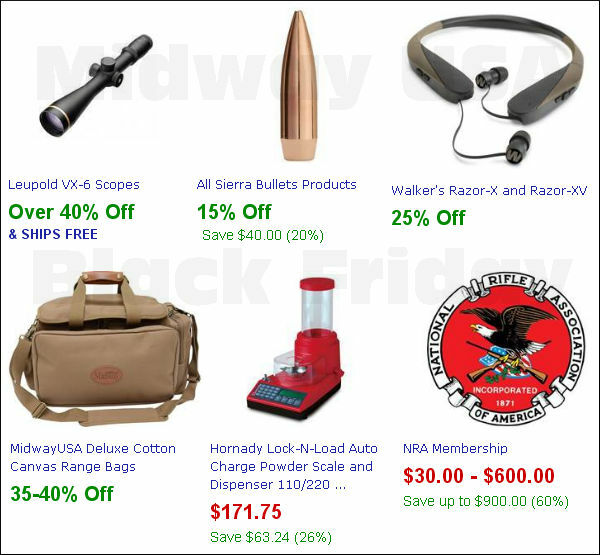 You’ll find these and scores of other super-deals on MidwayUSA’s Black Friday Sale Page. 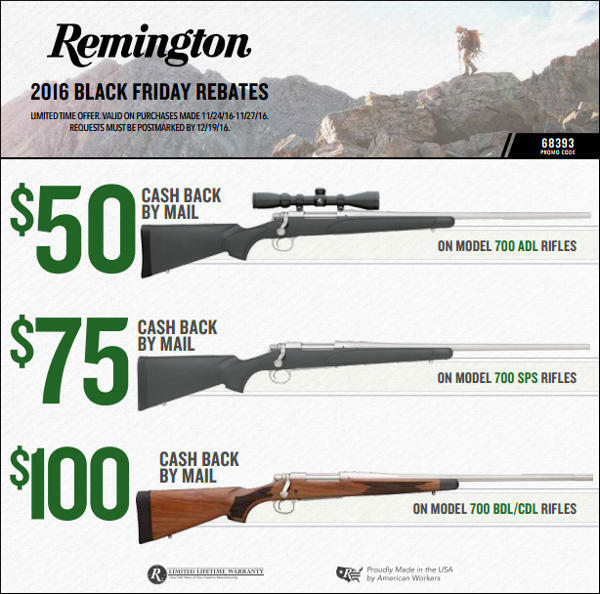 These prices are good through 11/28/2016 at 11:59 pm. 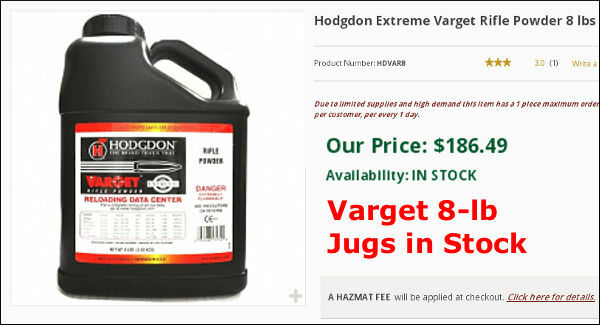 If you’ve been looking for Hodgdon Varget powder in the large eight-pound (8 lb.) jugs, Natchez has this in stock, as of Monday morning, November 21st. If you want this powder, you better jump on this. Supplies are limited. Sorry, no H4350 in the big jugs, but Natchez does have Varget in one-pound containers for $25.99 per pound. 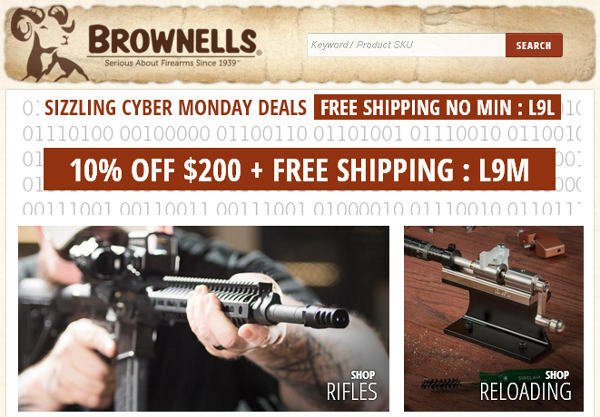 Brownells is the “go-to” source for firearms parts and accessories, and Brownells also offers a full range of reloading and gunsmithing tools. Now, with PROMO CODE L6G, you can save $10 off any order over $75.00, plus get FREE Shipping. That could easily save you twenty bucks or more on your next order. 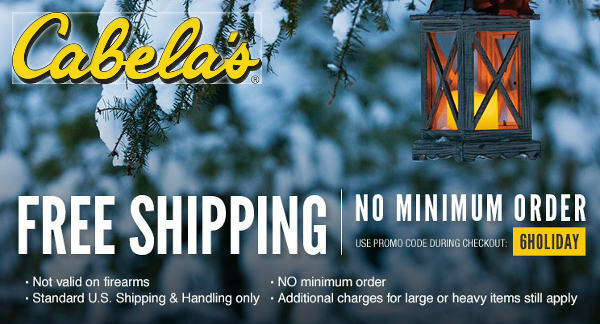 Note, this deal applies to online orders only, and you can only use one promo code per order. To qualify, insert CODE “L6G” during checkout. 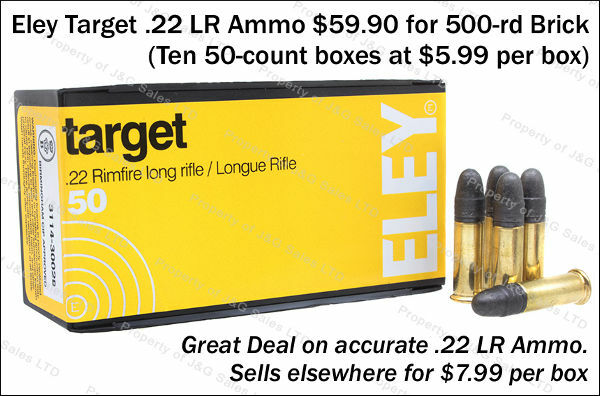 Yellow Box Eley Target is excellent .22 LR ammunition that is plenty accurate for all but the most demanding rimfire disciplines. This is way more accurate than bulk ammo which might sell for $4.00-$5.00 per box at stores. 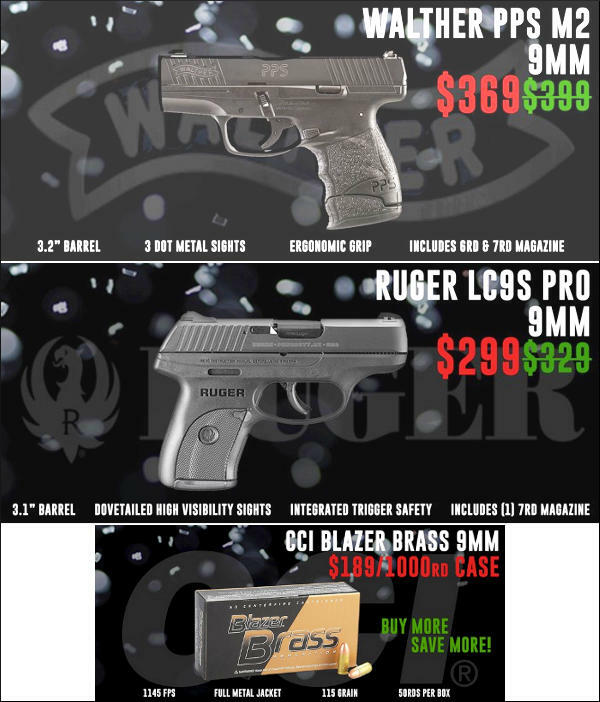 With this special deal at J&G Sales you can get a 500-round brick (ten 50-rd boxes) for just $59.90. 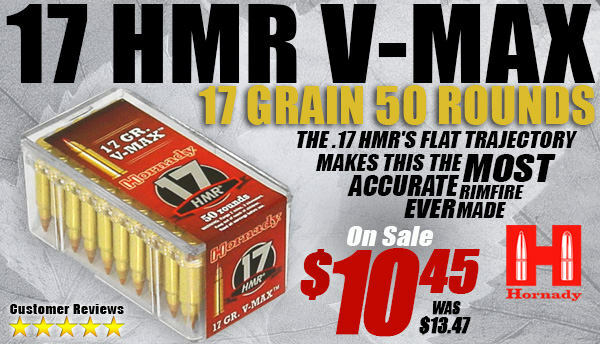 That’s a steal when you consider this ammo sells elsewhere (MidwayUSA) for $7.99 for a 50-rd box. 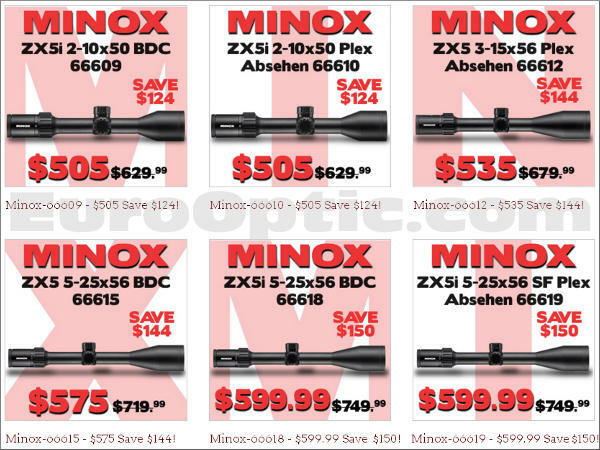 So you can save two bucks a box with this deal. That’s a 25% savings. 9. Amazon — Leight MAX NRR33 Earplugs, $7.58 for 50 Pairs. 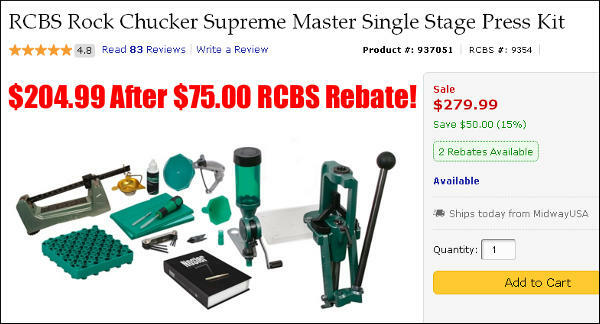 Share the post "Bargain Finder 62: AccurateShooter’s Deals of the Week"
There are a number of other small changes and additions in the latest revision of Form 4473. These changes are reviewed in great detail by Orchid Advisors, firearms industry compliance experts. 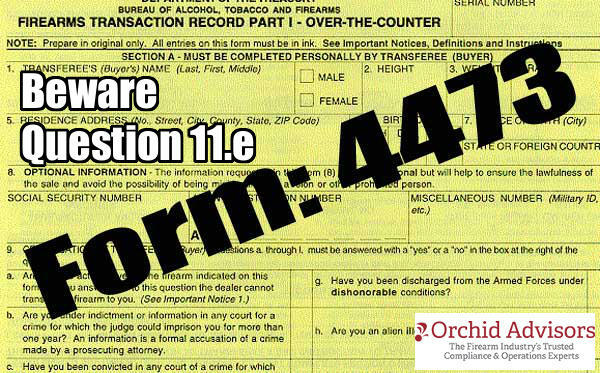 If you sell firearms, we recommend you read Orchid Advisors’ full Form 4473 Report on Ammoland.com. Below you can read all six pages of the new ATF Form 4473. 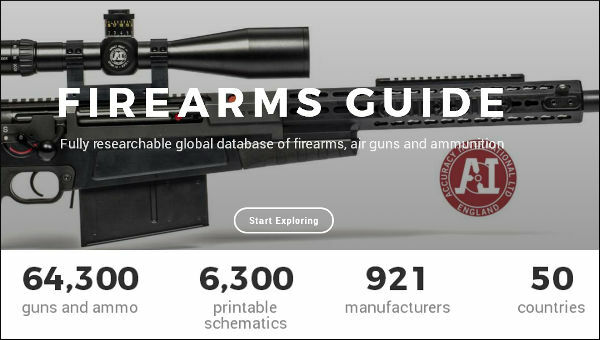 You can print Form 4473 from the ATF’s website at https://www.atf.gov/firearms/firearms-forms. FFL dealers should note that all six pages of Form 4473 must be printed and retained as permanent transaction records. 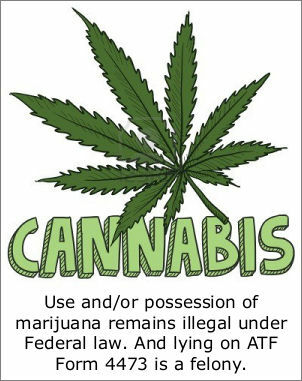 Share the post "Beware Cannabis Question on Federal Firearms Transaction Form"
On November 12, 2016, 46 shooters participated in the first Garand and Modern Military Match utilizing Camp Perry’s new Petrarca Range Electronic Targets. These Kongsberg eTargets allow instantaneous scoring and relieve competitors of pit duties. With no need to shuttle bodies back and forth from the pits, the matches run much more quickly, enabling more shooters to complete the match in less time. 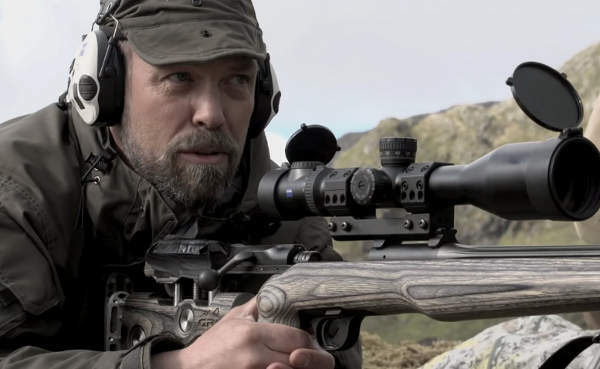 These Kongsberg targets work through the power of acoustics — “hearing” each shot and accurately triangulating its location. 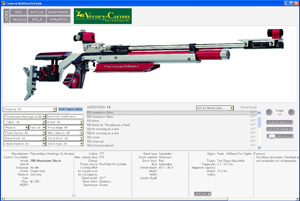 A variety of target centers can be employed, allowing the eTargets to be used with multiple disciplines. The electronic target system plots shot locations using acoustic sensors on each target frame. 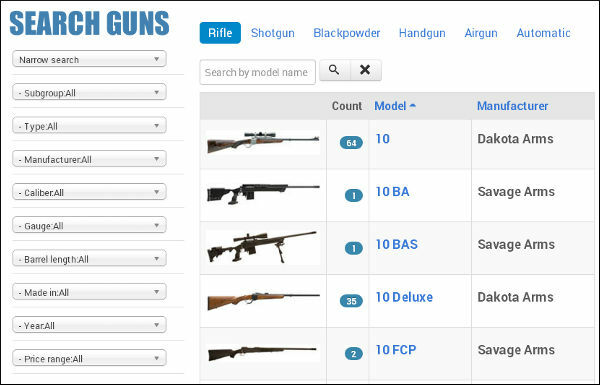 The shot placement (and score value) is instantly calculated by the central computer, and then immediately displayed on monitors positioned on the firing line next to each shooter. 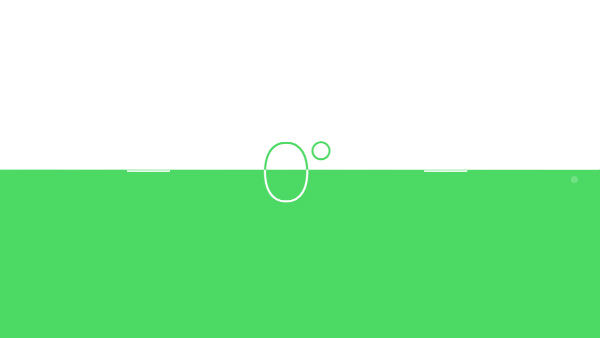 Competitors can instantly see their shot locations and score values. No target markers are necessary. This speeds up matches as targets no longer need to be pulled down, marked with a spotter disc, then elevated after each shot. Match competitors were pleased with the new target system. 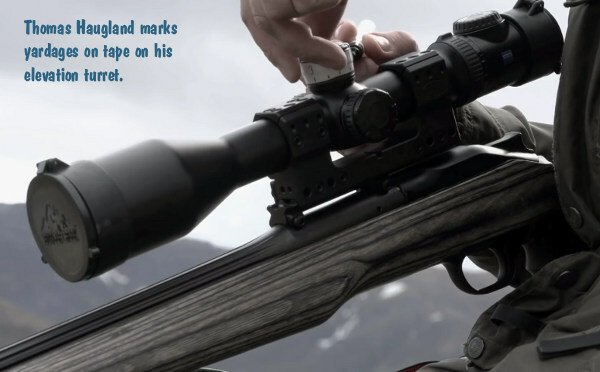 For example, Matthew Nodine and his sons Keegan and Isaiah, competed together in the Garand Match — each firing on the electronic targets for the first time. The Nodines, regulars at the National Matches at Camp Perry, were eager to experience the new system. 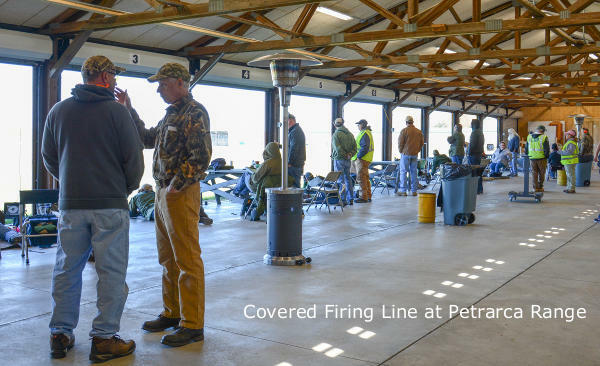 “Although my boys look forward to Camp Perry every year, they do not look forward to the target pulling!” Matthew Nodine joked. “It’s often hot and humid in the pits and makes for a long day. 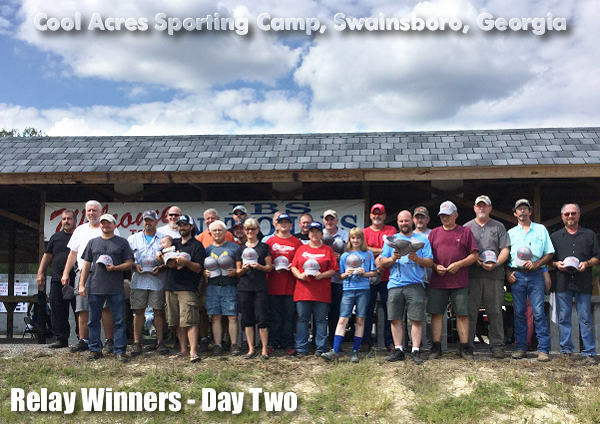 These [electronic] systems could eliminate that and make the shooting experience much more enjoyable.” Along with skipping out on pit duty, Matt says he and the boys enjoyed the system’s ability to eliminate human error that can come from both target pullers in the pits and scorekeepers on the firing line. 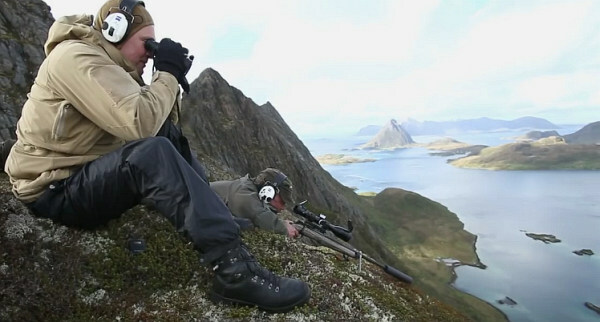 The family was also impressed with the swift accuracy of the communication between target and monitor. For others who feel this way, there’s good news. 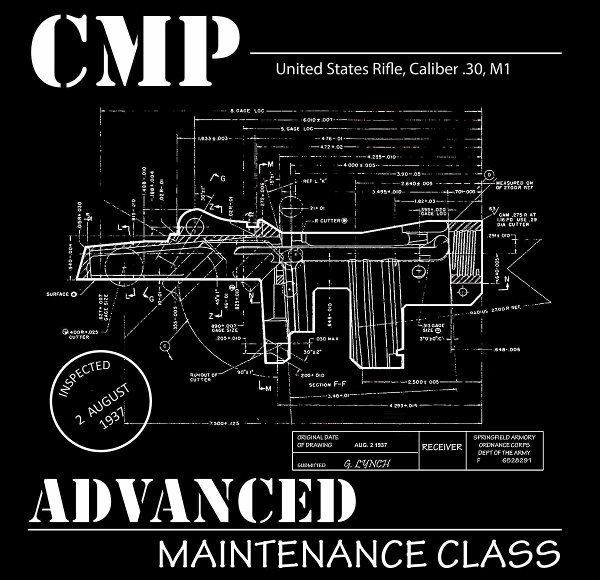 The CMP is currently discussing plans to install systems on each Camp Perry range in the future. Moreover, the CMP now brings a set of mobile electronic targets to its regional Travel Games. The CMP website will list where and when the mobile electronic targets will be deployed at regional matches in 2017. 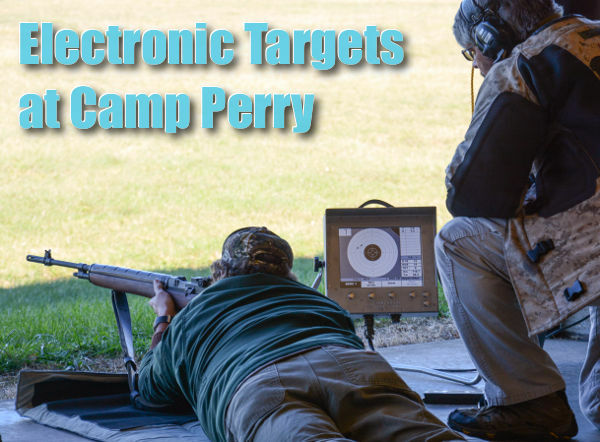 Share the post "CMP Hosts First Camp Perry Rifle Match with Electronic Targets"
Thanksgiving is just four days away. What better way to celebrate the occasion than to blast away at some bearded gobblers (of the paper variety). 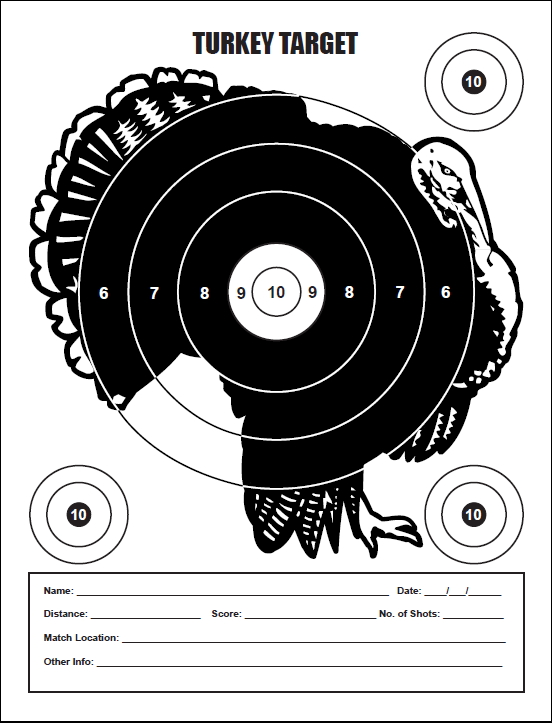 Here’s our custom Turkey Day target, ready for some family fun. This special Turkey Bullseye Target was created by our friend and Forum member Pascal (aka “DesertFrog”). CLICK HERE for FREE Turkey Target. 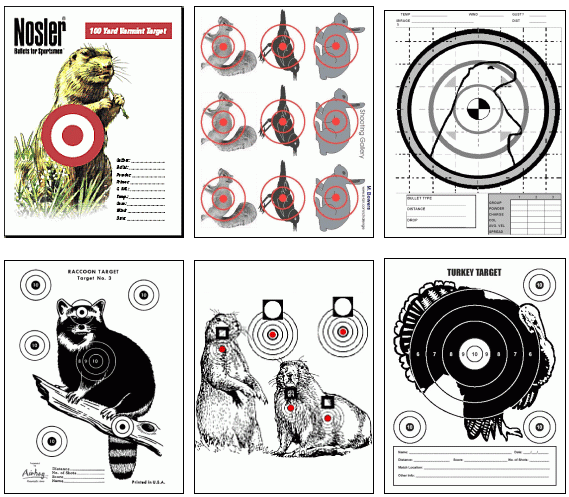 Share the post "Download FREE Turkey Target (and other Critter Targets)"